and I must say that I am impressed with so much research about the late roman army in Gaul. If I try to paint my minis as accurate as possible, I must say that I also choose the colors or the patterns of the shields according to my taste, and not to recreate real armies on the field... and I can not identify every unit ! Here you are the beginning of my late roman army for DBA (not based, not yet, sorry). The second unit represent Auxilia Palatina - at least I suppose, because I could not identify the shield pattern - maybe our scholar members may help ? 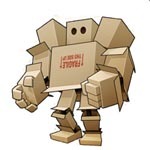 I followed the illustration on the Hät box. WOW Phil, this is a really an amazing work ! Especially what you did on the shields of the pannonciani seniores : i wish i could do the same. This is precisly those units i just can't paint. One shield pattern like this one is difficult to paint, but imagine when you have to paint...40 of those ! the second unit you showed is not an auxilia palatina. The notitia dignitatum, a document where all the late empire units are recorded, with shield patterns (except border units), location, rank and operationnal specialization does not contain that pattern. The last to are the less likely, because they are barbarian warbands under roman command, not real roman units. Concerning your medium cavalry, the shield pattern you choose belongs to a unit based in Gaul, but i planned to make it too, so i really want to see your version!! This is very interesting topic and pictures are very nice. Chariobaude wrote: the second unit you showed is not an auxilia palatina. This is highly interesting. I know the Notitia Dignitatum (for those interested, look at this excellent site by Luke Ueda's Sarson: http://lukeuedasarson.com/NotitiaPatterns.html), and because I could not find that shield pattern in it, I needed help, I can not find the mosaic you showed in your post, can you tell us where it is located (or a reference to a book, a site...) ? If I find time, I will start painting new units this week-end, probably the medium cavalry, I will complete this topic when I have new pictures. Of course I will keep on following your excellent project ! Thank you again for your help. Great paintjob! Some of the poses of these HäT figures are a bit difficult, but your painting style brings them to life. I love the color scheme you are using. Merci Phil ! Finding another crazy lover of history and miniature is always a pleasure ! About your project, i was thinking maybe you could make the army of Julian against the Alamanni. 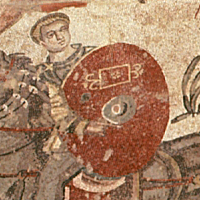 Pannonciani were located in Gaul during those times (and in first line during the battle of Argentorarum), and then you can paint the medium cav with the shield you proposed before. Cataphractarii are ok too (even they were blamed for their cowardness during the same battle, except for their officers who died, abandonned by their men on the right wing). Limitanei are ok, Roman commander Severus commanded several units of limitanei, located on the left wing. So you want challenging shield pattern, hmm ? Yes, it is written sagittarii nervii but it is an error in the notitia. (not iuniores, same error) Good luck with that ! is it challenging enough ? Look forward to know your choice Phil ! So I checked my photos yesterday, and it seems that I missed your guy , hence my question. I will look for documents describing these mosaics. you are right to say that they mainly represent hunt scenes. 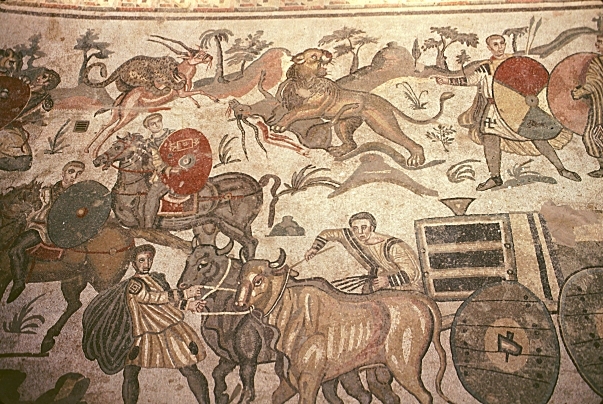 On the second picture, the hunters are looking for african animals, probably for the games in the Coliseum (or similar places). One of the horsemen has a shield that looks like one of those you painted yourself, am I right ? so you even went to that place, lucky you ! Well, the victores pattern is beautifull, and i propose it last because it is surely the most hard to paint : you really like the challenge, and i really want to see the result ! As Chariobaude proposed, I've just started a unit of not-so-Bructeri-but-more-likely-Victores Iuniores . This is a picture of the test mini, and I must admit that the shield took most of the painting time. What do you think of it ? His colleagues are on the way. WOW, this is precisly the pattern recorded in the notitia !! I love it very much to see how you French guys are excelling in exchanging and sharing with us this historical research material about this late Roman and often under-exposed period of early Christian history. We do it for science !!! PhilC wrote: We do it for science !!! Well, that's what my therapist thinks, too... You aren't a disguised therapist wearing a military dress and rabbit ears, are you ? Did you discuss this hobby with your therapist? If so, would you mind tell us a little bit more about his or her conclusions? Because that would be helpful for most of us I think. PhilC wrote: You aren't a disguised therapist wearing a military dress and rabbit ears, are you ? Well, I am afraid I am not allowed to tell you very much more about this. Only that the rabbit ears are fake. tumbling over your post I see that you share the same passion for late Roman period with Chariaubade. I agree this is a very interesting period with a lot of dramatic changes in history and in warfare, but I have never been attracted to this period - mostly because of lack of appealing figures (except Cataphracts). When reading about this topic I remember that there is quite a lot information about late Roman period in the Roman and Celtic museum in Mayence. There collections are ever increasing. One question. Cataphracti to me are closely linked to eastern empires - mostly Sassanides and Perses and also Sarmatians on the Balkany. I understand the Romans copied these units from these cultures. Are they documented in battles out of the middle-eastern or balkan region? 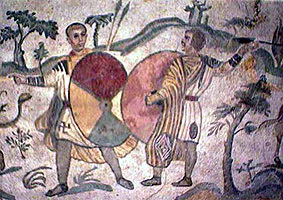 As far as I know (I take my information from Osprey Warrior 15 - Late Roman Cavalryman), cataphractarii were introducted in the roman army in the 2nd century AD, and modelled on the Sarmatians, while Clibanarii were probably introduced during the 4th century AD and inspired by sassanid Persans. As explained in the book, many Sarmatians were settled in Gaul, and several units had gallic names. So it seems likely that cataphractarii were sometimes engaged in battle in western Europe. Well, this is only one secondary source of information, maybe the honorable members of this forum might help us answer your interesting question ? yes, like many other tactics, skills or equipments, romans did copy very heavy cavalry from both sarmatian/alans and sassanids. strange thing is that cataphractarii has always prooved to be an useless option : Romans managed to always defeated heavy cavalry units with their disciplined infantrymen without any problem. But, at the end of the second century, it became "in" (or "badass" ) to have such units, starting in reality with cavalry officers or regular units called cataphractarii because of their heavy equipment. If i remember well, the first unit composed by only cataphractarii is the ala nova Firma milliaria cataphractaria. Diocletianus created a dozen of units, mainly in Egypt, Gaul and north italy. In a speech of Julian, his uncle Constancius II is described as the emperor who really developped that weapon (so around 350). Julian, in the same speech, deals with cataphractarii on the Constancius side, but we don't have any other information on it. And Ammianus, who described the battle of Argentorarum, wrote that on the left wing two roman commanders of cataphractarii died bravely but the two vexillatio (300 horses each) they commanded ran away on contact with the barbarians. Zozimus wrote that Julian was very upset, but due to the lack of troops, he couldn't punish them as he wanted (like decimatio), but found an another (funny) way : the cataphractarii had to parade in front of all the army... dressed as women ! It seems that the punishment was so shameful that the men were transformed into lions in successive combats ! Ah, et joyeux Noël à toi ! Great painted figures but also a nice history lesson! Thanks for sharing!